Caramel Wings: Salted Butter Caramel and Twix/Mars Brownies. Mmmm-nom. Salted Butter Caramel and Twix/Mars Brownies. Mmmm-nom. The good thing about Brownies is the ease with which they can be transported from place to place. After sending a basic Brownie, which was pretty amazing, to my boyfriend 1000 miles away, I thought I could experiment with something more gooey for short haul travel - 10 minutes from my place. It is the best friend's birthday today. I know how much she gorges on all the treats I make at home. 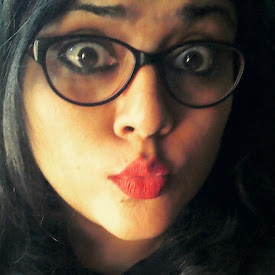 And what could be a more apt gift for someone who you don't know what to gift to just because she has every darn thing?! The answer on most occasions lies through the stomach and I feel blessed to do something about it. She loves Brownies, she loves Twix, she loves Mars and she loves Caramel. Why not put all of it together and see how far I can push it with Brownie experiments? Lucky for me that it turned out something which can be only described in one word - Nom. Or maybe I could write a book on that later. I also am a huge sucker for Salted Butter Caramel Sauce. I had made a Salter Butter Caramel Gelato few months ago but believe me all that went so fast, I had no time to take pics of the final product despite having step by step pictures of the whole process. So glad that I got to include the sauce as an element in this recipe! Okay now without much further ado, here is the recipe. Recipe for Brownie from Laura in the Kitchen (I doubled the recipe as under) and Salted Caramel Sauce from Manu's Menu (I halved this recipe as under). 2 bars, 1 each of Twix/Mars or whatever chocolate you wanna add. You can go crazy with the quantities here. 1 stick Butter (100gm), Room Temperature. Not melted. 1 tsp Almond Extract. You can use Vanilla too. In a small pan, pour in the Sugar and then Water. Do not stir. Put this on medium heat. You will shortly see that the Sugar starts to bubble up. Do not stir or swirl the pan at all. Just watch it closely as it changes it's color to Amber. Here is a photo for color reference. Once you see it turn the last color, take it off the stove, and add some cream. Be very careful as this is going to splutter and splatter all around. Better to wear mitts if you're inexperienced. add the remaining cream and stir with a whisk or a spoon. Then add in the Butter and salt. mix to combine, and transfer it to a bowl and let it cool while you work on your Brownie! Get your semi sweet chocolate melted. I chopped it into big pieces and microwaved for 2 minutes in my 800W microwave. Nice and smooth. 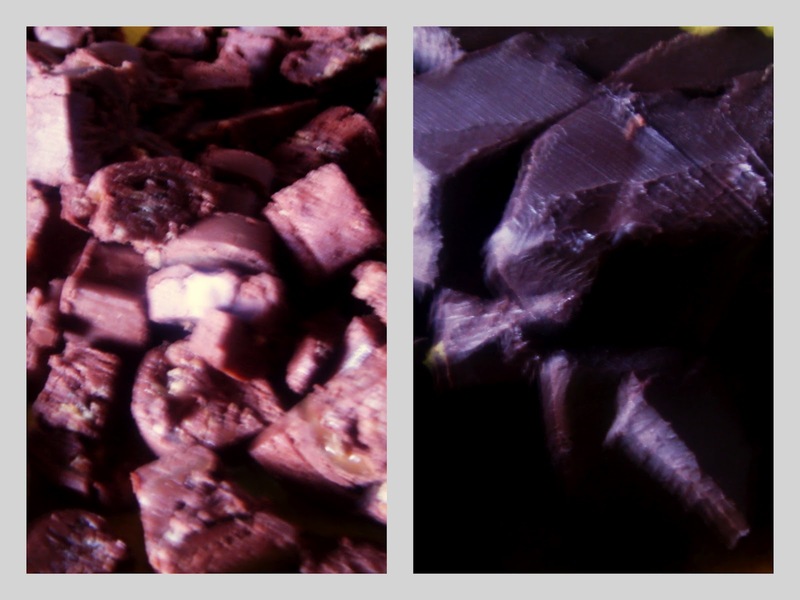 Chop up the mixed chocolates, Twix/Mars into chunks. Preheat oven to 170C/350F. Grease your Brownie pan and line the base with Parchment/Butter paper and keep it ready. In a small bowl combine the 4 tbsp warm water with the coffee powder and set aside. Now you could manually whisk in the wet ingredients but I was pressed for time so I used my mixer for it. 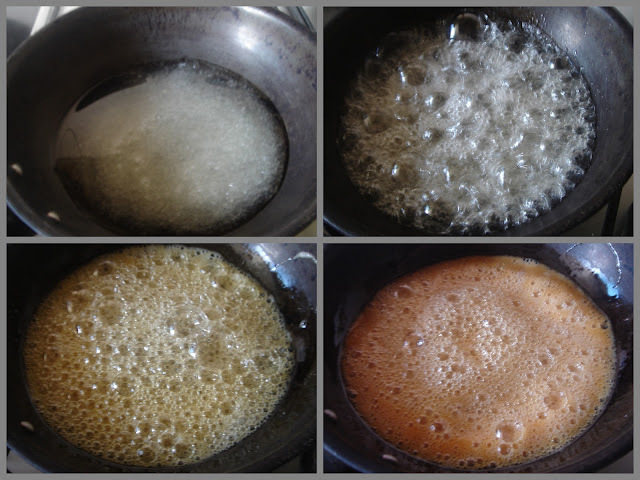 Cream the Butter and Sugar together till it's nice and fluffy, and then add in your Eggs+Almond Extract + Coffee/Water mixture and beat them well. Then add in the Melted chocolate to it and mix well. Add the dry ingredients to the wet mixture. I had to use a big bowl for this since I had combined my wet mixture in my mixer. You have to mix the dry ingredients into the wet, but not over mix them. Don't just stir it. Try to get your spatula working along the circumference of the bowl while gently mixing the ingredients together. I remember reading somewhere that 40 strokes are ideal for the batter to mix just the right way. Then add in your chopped assorted chocolate pieces. Mix. Pour half of this batter into your baking pan, and then pour over the Caramel Sauce. If the Sauce seems to have hardened, just gently heat it up for a minute or so on low heat and it should get nice and runny again. swirl the caramel around with a knife tip of a toothpick and then pour the rest of the batter over it. make sure it's evenly distributed. Tap the brownie pan a couple of times on the kitchen surface so all the air bubbles rise to the top and you get a nice, dense and fudgy brownie. Bake this baby for 55 minutes, but keep checking on it. Mine took 60 minutes till I got soft wet crumbs on my toothpick when inserted in the center. That is the consistency you're looking for too. There should be wet crumbs on your toothpick/knife when you insert it in the center of the Brownie. Remove this baby and allow it to cool for 15 minutes before you loosen the edges and turn it around on a wire rack where it would completely cool. A cracked top is the sign of an amazing brownie! Also, A very Happy Birthday, dear Bestie! Love you lots!